Hi everyone! Anyone else experiencing the Monday blahs? To make matters worse it's rainy and gloomy again here in Toronto. I decided to create another glitter gradient pick me up since I loved the look of my previous post. 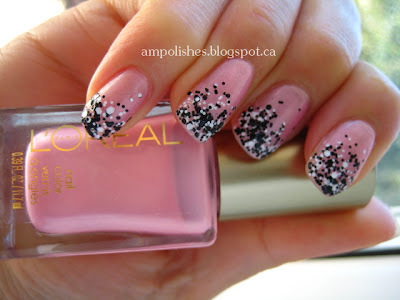 This time I have L'Oreal I Pink I'm In Love from their Colour Riche line and colour riche top coat confetti. I used Confetti in a previous post here. L'Oreal Colour Riche I Pink I'm In Love is a shimmery light pink. In contrast to the other Colour Riche polishes this one was very very sheer. Even after two thick layers my nail line was still quite visible, on the plus side the dry time was pretty quick. Personally, I don't like pink polishes very much so I don't see myself wearing this colour alone in the future. So when I had this colour on I had an idea to create a glitter gradient to cover the visible nail line and subdue the pink. I applied the glitter directly onto a sponge and dabbed away. Because the sponge is so absorbent I needed to reapply the glitter a couple times before achieving the look I wanted. A top coat is also needed to smooth out the grittiness since the glitter base is absorbed in the sponge. L'Oreal Colour Riche polishes are 11.7ml in size and are sold for $6.99, L'Oreal Colour Riche Nail Top Coats are 5ml in size and are sold for $6.99. Both can be found in most drug stores in North America. Very pretty, love the glitter coat! love love love the glittery tips! Me too! So easy to do too.